Wear a healing starcode accessory close to your heart with our first design of women’s necklaces! Each piece is custom created and made with love. The star code typically will be etched onto the hammered copper back side or can go onto the front. 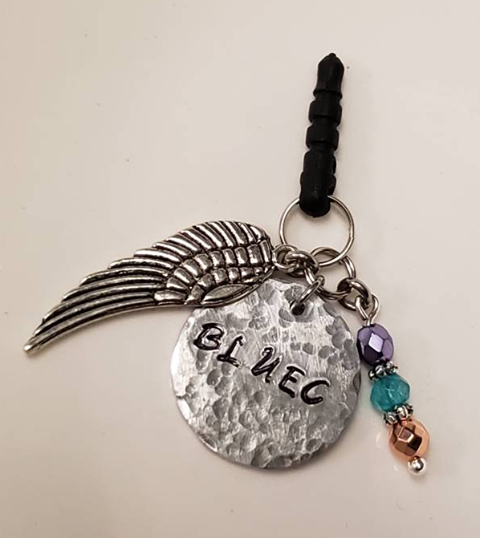 As we grow we can accept a limited number of custom orders…so if you prefer to have the healing starcode on the outside, we will try and accommodate you. 16″ stainless steel (non tarnish, hypoallergenic) chain with a 2″ extender for adjustments. Because of the custom nature, I do not accept cancellations or returns unless the item arrives damaged. Shipping charges are for 1 item and reflect shipping within the USA. Message me for shipping costs outside of the USA and for additional item shipping costs. Each item is blessed by Archangel Michael and myself prior to shipping. 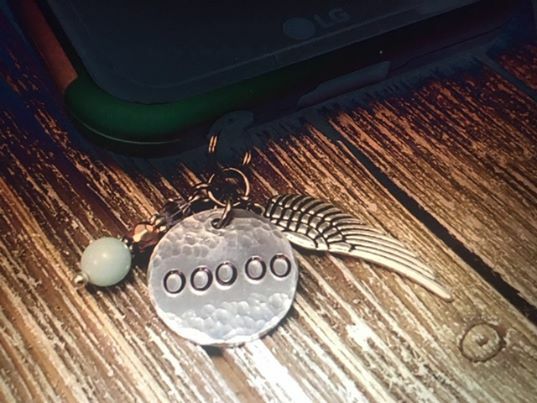 Hand crafted, made with love light language encoded cell phone dust charm to help you increase prosperity from Archangel Michael. This charm fits all iphones up to version 8. What is pictured is not the complete code, showing the lettering style. The back side also is hammered and etched with the code. 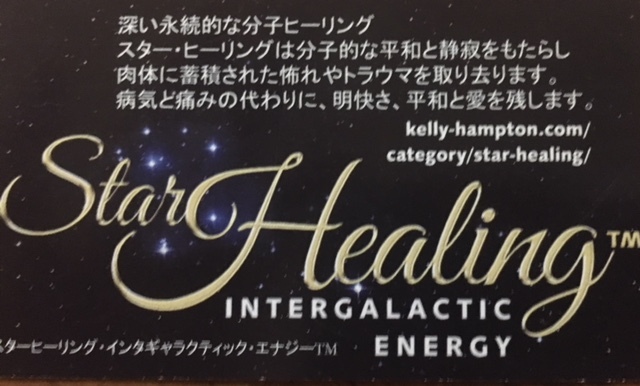 Star Codes are an extension to Star Healing Intergalactic Energy, on our planet since 2010. Shipping costs shown are within the USA. Additional costs will occur for shipping outside of the USA. Because of the nature of the items I do not accept cancellations on orders or returns, unless the item is damaged upon receipt. Each item is blessed by Archangel Michael upon shipping. 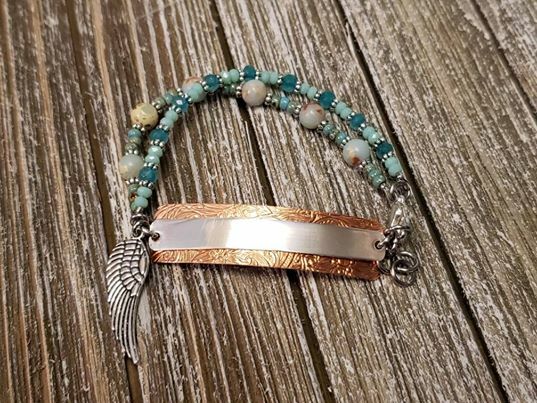 Beautiful, light coded copper and sterling silver women’s bracelet to help ease physical pain. The silver will be etched with the actual code. Please refer to the photo of the lettering for the lettering style. The copper has been coated to prevent tarnishing. Adjustable link with lobster claw closure. This bracelet was designed to go with our earrings, which can be coded with the same code or a different one. When not wearing your StarCodeCreation, consider keeping it in your energy field. In some cases per AAMichael, multiple codes…like self love…may be necessary. In the most dense situation, he recommends a full Star Healing Intergalactic Energy session or sessions, of which I am the founder. Shipping is quoted within the USA. Additional fees for shipping outside of the USA along with longer delivery time. Come grow with us together! Beautiful hand made stamped starcode bracelet. (the actual code is not shown but will be stamped within the sterling silver. see photo of the lettering style). TEAL/AQUA beaded band: includes genuine aqua terra jasper, glass, and glass Japanese seed beads. The power comes from the star code. The copper is coated to prevent tarnishing. In some cases, people may benefit from the use of more than one code. These are highly charged healing codes from Archangel Michael. Each piece is made with love and blessed by Archangel Michael and myself, Kelly Hampton, prior to shipping. If you are unsure what codes you will benefit from you may choose to book a private reading, of course. Start with wearing/using one code at a time if you are not used to working with energies. You do NOT need to feel anything. Kindly watch my videos to learn more. This piece matches the earrings. You may consider matching the prosperity bracelet with a self love set of star earrings! The choice is your’s of course! 🙂 Shipping quoted is within the USA. Additional shipping costs will be incurred for outside of the USA. Quantities are limited as we grow together! Each item is crafted with love and care. Beautiful, custom made non hypoallergenic, SELF LOVE starcoded earrings channeled from Archangel Michael. Highly charged light language to help you increase love of yourself. Stainless steel wires with backing. Please refer to the lettering photo for style of lettering currently available. They are 1/2″ wide and total length is 2 1/4″ (1 3/4″ drop length). The copper has been coated to prevent tarnishing. Take care of your bracelet as you would any other piece of jewelry. Because of the nature of these items, unless they arrive damaged or defective, I can’t accept returns for custom orders and I do not accept cancellations. In some cases, multiple different star codes may be desired or necessary for greatest benefit per Archangel Michael. Please refer to the lettering style photograph. Some codes are numbers, some colors, some letters, some a combination of all of them.Starcodecreations are shown without actual code. 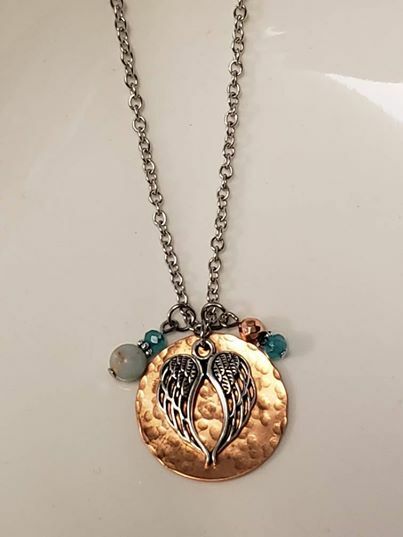 When you are not wearing them, keep them near a bedside table so that they are still in your energy field, although some people feel their energy from across the room.You do not need to feel anything… A portion of your purchase (s) will go to help the homeless, through rotating charities. If ordering from outside of the USA, additional shipping charges will be due. Please feel free to share your transformations with us and remember to give love and kindness and gratitude to yourself and others regularly and use other tools of transformation. Each item is made with love and blessed by Archangel Michael and myself upon shipping. Each item is blessed by AAMichael and myself prior to shipping. If you would like a specific blessing/prayer please indicate this at the time of your purchase. 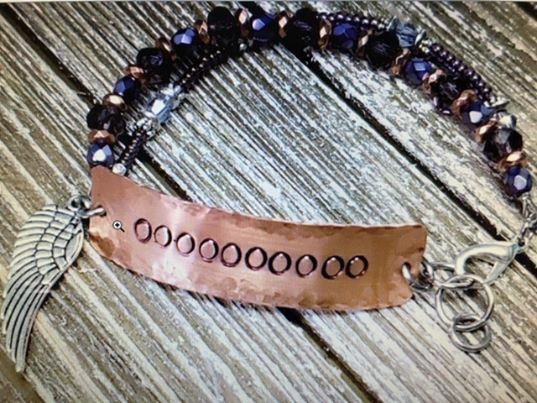 Created with love, this handmade copper stamped woman’s bracelet is etched with the manifesting light code from Archangel Michael for greater prosperity in your life. 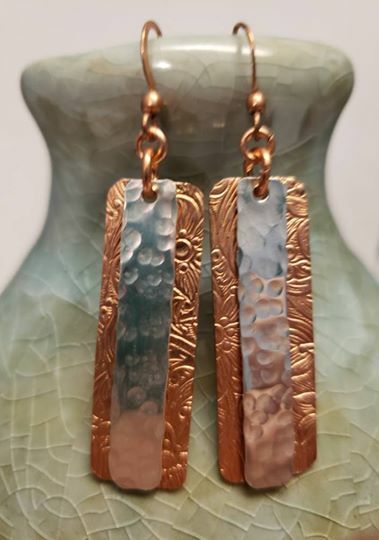 The copper is coated to prevent tarnishing. PURPLE band includes Czech glass, rose hematite, and glass Japanese seed beads for beauty, though the power comes from the light codes themselves.Adjustable links with lobster claw closure. All codes were transmitted from Archangel Michael and each product is also blessed upon shipping. Because of the nature of these items, unless they arrive damaged or defective, I can’t accept returns for custom orders and I do not accept cancellations. Code shown in all the products is for the style of the lettering and NOT the actual harmonic code. Give the codes time to integrate. In some cases, more than one code may be necessary per AAMichael and in the densest of situations, he advises combing the starcodecreation(s) with a Star Healing Intergalactic Energy remote session, of which I am the founder. Each item is blessed upon shipping. Additional shipping for outside of the USA. When not wearing, consider keeping the bracelet in your energy field. Come grow with us! Beautiful, custom made non hypoallergenic, prosperity coded earrings channeled from Archangel Michael. Highly charged light language to help you increase prosperity. Enameled copper will not tarnish. Stainless steel wires with backing. Please refer to the lettering photo for style of lettering currently available. They are 1/2″ wide and total length is 2 1/4″ (1 3/4″ drop length). The copper has been coated to prevent tarnishing. Take care of your bracelet as you would any other piece of jewelry. Because of the nature of these items, unless they arrive damaged or defective, I can’t accept returns for custom orders and I do not accept cancellations. Each item is blessed upon shipping. 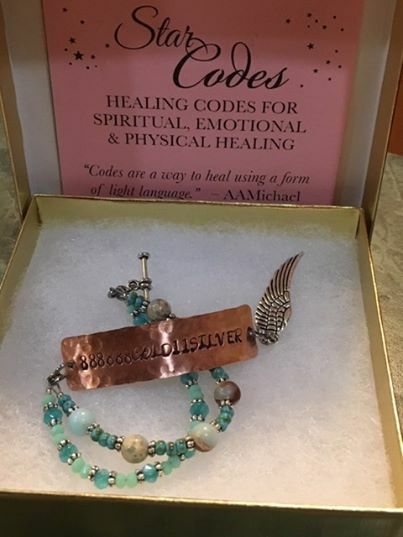 In some cases, multiple codes may be necessary for greatest healing benefit per Archangel Michael. Please refer to the lettering style photograph. Some codes are numbers, some colors, some letters, some a combination of all of them. Products are shown without actual code imprinting. Know that a portion of your purchase will go to help the homeless, through rotating charities. Tell your friends, share your transformations with us and remember to give love and kindness and gratitude to yourself and others. More on their way! Custom made copper stamped bracelet star coded to facilitate ease of manifesting in your life. TEAL/AQUA beaded band: includes genuine aqua terra jasper, glass, and glass Japanese seed beads. The power comes from the star code. Codes shown on all items are representations of the lettering style and NOT the actual code. Adjustable link, with lobster claw enclosure. There may be slight variations in the colors of the beads. The copper has been coated to prevent tarnishing. Because of the nature of these items, unless they arrive damaged or defective, I can’t accept returns for custom orders and I do not accept cancellations. Presently, shipping quoted is within the USA. Shipping outside of USA will incur additional shipping charges. Know that a portion of your purchase will go to helping the homeless, with a rotation of different charities. (My Star MIssion)…Multiple codes may be effective and necessary for maximum healing, so consider the other items.. be moderate at first, starting by wearing one per AAMichael, unless you are used to charged energies. You may also customize your bracelet for one of these star codes: pain, self love, prosperity. Please indicate if different from the pictured item. Each object is blessed by Archangel Michael and myself, Kelly Hampton,, prior to shipping. Come grow with us! 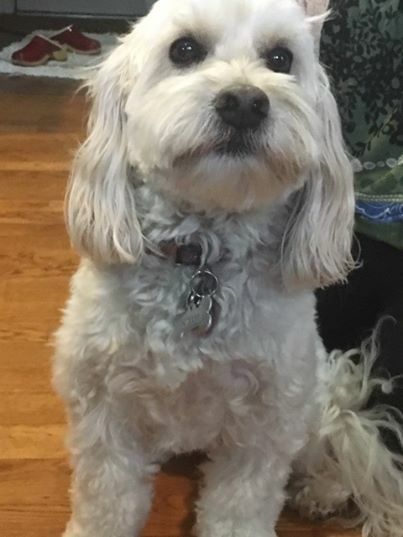 Help your dog become less anxious with this hand made aluminum dog tag encoded with the appropriate harmonic healing (light language) code from Archangel Michael. The numeric code pictured is NOT the actual code–only a representation of the lettering style. This size best for medium sized dogs. Animals like people, may benefit from additional healing codes per Archangel Michael. *** Contrary to the f/b terms listed, because of the nature of these items unless they arrive damaged or defective I can’t accept returns for custom orders and I do not accept cancellations. Also, tags in stock do NOT have engraved heart. Shipping is within the USA only now as we launch.Know that a portion of your purchase will go to help the homeless, through rotating charities. Come grow with us! Some animals, like people, will maximize their benefits with the use of multiple codes, depending upon the severity of the anxiety. Give the light codes time to integrate and continue to send love and kindness to your dog. Each of our items is mindfully made with love and kindness. Cat tags will be launching soon.